Summer is all too short in Canada, and most Canadians try to make the most of it. 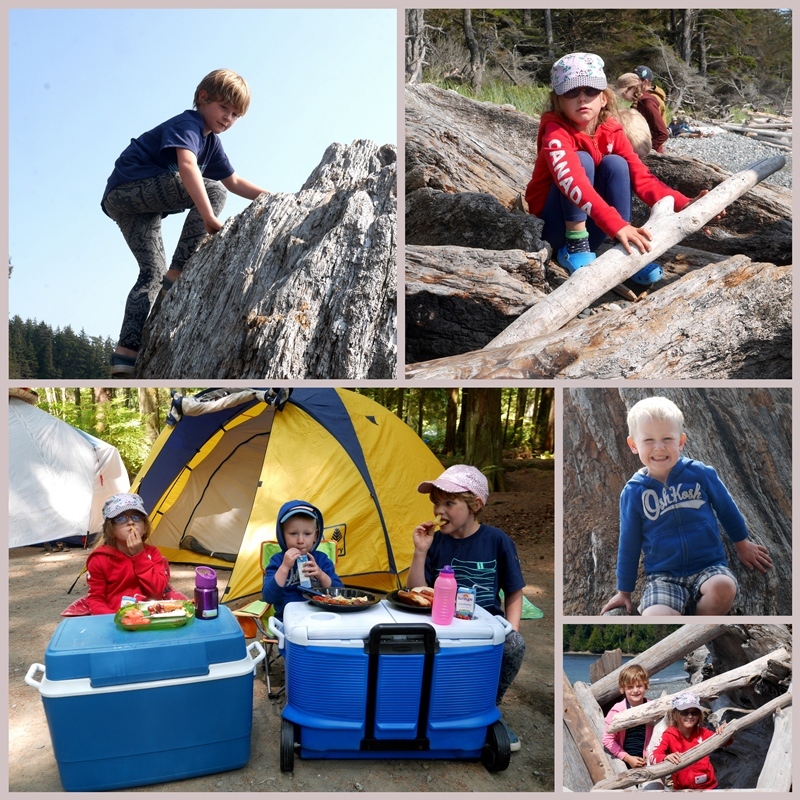 This past weekend, we, along with our three children and their children packed up tents (one tent trailer), coolers filled with delicious food, folding chairs, and all the paraphernalia that goes along with camping and drove out to French Beach Provincial Campground, about an hour away. The eleven of us (8 adults and 3 children) had two sites and we set up our homes away from home, in the forest, before trekking down to the beach. The waves break upon the shore in constant rhythm, rushing forward to tumble stones upon the sand before falling back to build again. Mesmerizing. 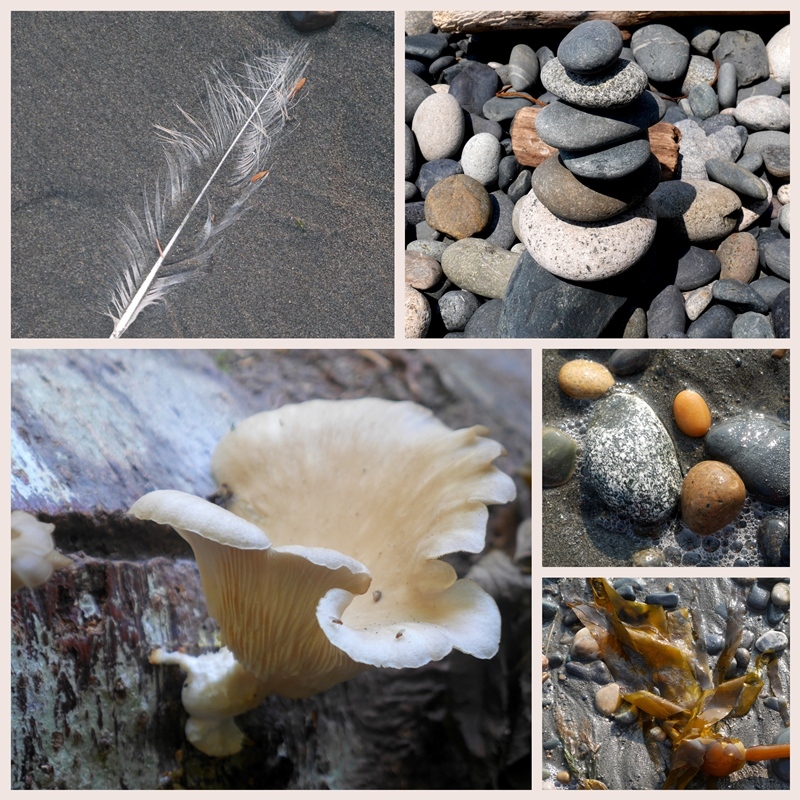 I snapped mostly beach treasures, with a few forest finds from our hike through trails overgrown with salal trails where it seems few others ventured. We walked or sat on the beach, with piles of smooth stones that begged to be held and caressed, or built up into stone towers. A few made their way into pockets and carried home where they will be tossed into a pretty dish as a memento of a lovely time together. The beach is endlessly entertaining for the children. They climbed huge, uprooted logs that had been weathered by the sea before being tossed up onto shore. They imagined shelters, ships, and animals. It was much cooler there than in town and we could have done with a few more jackets. Fortunately, we all had enough blankets and bedding so we were warm at night. There were no mosquitoes or bugs to bother us, either. We spent two nights camping and enjoyed lots of laughter, good food, and some serious chats together. One very unexpected thing happened - I woke up very early on Saturday morning in agony. I'm fairly stoic, but this pain on my right side and back was worse than anything I can remember. After walking around the campsite for about 45 minutes (sitting or lying down was impossible), I finally woke Tim and asked him to drive me to the hospital, an hour away. It was a dreadful drive. Fortunately, the emergency department wasn't busy and I had a CT scan almost immediately - a kidney stone. It passed about 3 hours after the pain began, and I felt absolutely fine, so we went back to the campsite. Interestingly, the physician who attended me said that there were 3 other women in the ER at the same time, all of us with kidney stones on the right side. Weird! Have you ever had a kidney stone? Last night Tim and I went down to the beach to watch the sun set. Such loveliness. We came back into town around noon. The temperature difference is remarkable and a cool shower and loose clothing were most welcome. Do you like camping? What was your last camping trip like? What a delightful way to vacation with your family. I'm not much of a camper, but this looks to be a great experience. Canadian summers may be short, but I can tell you that Texas summers are not. I envy you! You were so fortunate that a hospital with good facilities was nearby and treated you so efficiently and quickly. I have never experienced a kidney stone but I have heard how painful they can be until they pass. Your grandchildren will always remember and cherish these happy memories spent with their cousins, aunts, uncles, and grandparents when they are older. A memorable weekend, so fortunate you were relatively close to a hospital. Looks like the children had a fun time .... lovely photos! Happy Monday! Sounds like a wonderful weekend, apart from the emergency trip to hospital obviously. Thankfully I have never had kidney stones but was unfortunate and had gall stones which had to be removed surgically along with the gall bladder. We used to love camping when the girls were young it seems to be a thing of the past for us these days but we still have lots of lovely memories. Your Grandchildren will have cherished memories of a wonderful trip. How wonderful to have such a gorgeous place almost on your doorstep and to be able to share t with all the family doing stuff together in the wild! And no mozzies. I'm glad you managed to get treatment so quickly for your kidney stone pain. I can imagine how painful it was having had 4 gallstones and a ruptured gall bladder removed 14 years ago. Happy Mosaic Monday. Love your mosaic this morning. Did you stack the rocks? I am fascinated by rock stacking and the those who have patience to stack them. The little ones look like they are enjoying the camping. Never had a kidney stone. Had gall stones and the gall bladder removed years ago, but I have heard that your pain is horrible. I haven't been camping since last summer despite having a newer camper with a queen sized bed now. You snapped a lovely summer sunset. First of all, what a beautiful time with the family. I can’t get over how big the grands are getting. Had to look twice at your adorable grandson who has grown so much since last I saw him. No! Not a kidney stone. (Alas, yes, I have had way too many experiences with them. My husband had a kidney stone about 6 years ago. Your trip - aside from the stone - sounds lovely. What a perfect weekend, apart from your pain filled moments. So glad it was not any worse, I know how horrid that pain can be. Your photos made me think of a kind of 'Five go to...' holiday! Oh you truly have captured the beauty of Canadian summers. I hope you are enjoying all of summers delicious offerings with your sweet family. Beautiful images from your camping trip. Cute kids. I have not had a kidney stone and I don't want one! I'm so glad yours passed quickly and you were back with the family in a short time. I wish my summer was as pretty as yours. Mine is just hot, hotter and hottest. !!!! Have a lovely week. Oh poor you Lorrie, yes, no pain quite as excruciating as a kidney stone! Had one years ago and then another a few months back - ended up in ER both times. Thankfully you passed it very quickly. Such a lovely weekend otherwise, your family is delightful and it's great you can all get together and make such lasting memories together. I see a beautiful photo book from your photos of this weekend. The scenery is certainly beautiful along the island coastline - I look forward to a quick peek soon! Oh, Lorrie! I have not had a kidney stone but I've heard how painful they are. Your family camping trip sounds fun! My last camping trip was a girls' trip to Christina Lake. My cousin and I each had a little tent, some books, bikes and wine. It was fun! Dear Lorrie, What a fright it must have been for your family...not knowing what the terrible pain was all about. I'm so glad that the stone passed and you were able to be in a nearby hospital to get professional help. You live in a beautiful part of the world. Your children and grandchildren will thank you for sharing and for their beautiful memories. It usually takes a few days for them to pass so this was good! The only time I've been in an emergency room in the past 20 years was because of kidney stones. I had NO idea what was wrong but I had never experienced pain like that! Now I try to drink more water and never take a tums (which I used to take a lot). They are terrible! I'm glad you were able to have fun. The kids sure look cute at their little ice cooler tables! Hugs! I'm so sorry to hear your wonderful seaside vacation was interrupted by a kidney stone attack, Lorrie! I never had a kidney stone but I am an RN who worked in the emergency room at times and I saw how painful they were for patients. I'm glad to hear your stone passed quickly and that you have no follow up problems. It looks like your grandchildren had a wonderful time and you all are making the most of summer! It is hard to believe it is August in a few days! It looks like a lovely camping spot--not too hot or cold, and some amazing stones to bring home. Speaking of stones--wow that is amazing the pain came on so quickly and you passed the stone in three hours. So nice you could go back and join the group. It seems like I've heard of more women than men recently with kidney stones, and I used to think it was a "man thing." I echo the other comments about being close to a hospital. I'm glad that the kidney stone attack didn't disrupt the camping trip too much. It's amazing how a tiny stone can cause so much pain. The campsite looks beautiful, but oh, how horrid to have a kidney stone there -- impressive that you were able to get back to complete the weekend with family. My husband had one many years ago, in San Francisco for work, and from everything I've heard, it's agonizing pain. Almost started to say what a perfect weekend -- and -- except for a kidney stone -- it really was!! There is nothing like a Pacific Coast camping trip -- and yes, we've taken many with family at all stages -- once a four-generation getaway ... that was a special time for sure. I'm so glad the stone episode 'passed' fairly quickly and you were able to go back to camp -- I've never shared that particular experience, but can name a handful of (real-life) friends who have and I know how painful they can be. Take care! Oh my, a kidney stone attack while camping. I felt your pain. Lovely area to camp and explore. Definitely, memories in the making for all three generations. I have camped across Canada from Ontario to British Columbia and from Ontario to Atlantic Canada. A wonderful way to see and experience our amazing country of Canada. Except for the kidney stone this sounded so much fun. I've seen my eldest son in agony from the same thing so I know how helpless your husband must have felt as he watched you. Your family campout by the beach is just fabulous! An experience you most likely couldn't replicate somewhere in a building, however nice it is. Your grandkids will be talking about it for years. No kidney stones here...thankfully! Sorry you had to deal with that on your camping trip. Our last camping trip to Tulameen would have been lovely, but for an accident that happened back home on our farm while we were away. It's hard to relax when there are problems back home. How did your grands get so big so fast? Enjoy the rest of the summer! So nice to spend time with family, especially the grandchildren … happy memories. So sorry about your kidney stone, I have heard they are very painful, but have not experienced one (yet). Glad all was sorted.